Health Update: So after a plethora of tests, including a scary initial blood panel that showed elevated liver enzymes, what it comes down to is...gall stones! Which, although I would rather not have, is a better option than the other scarier options that were looked into by my doctor. I have a referral in for a surgeon, and hopefully will get the blasted thing removed pretty soon so I can move on with my life. I just hope that I don't have any more attacks before the surgery. I'm a little concerned about how much ground I will lose by not being able to workout after the surgery, and am actually kind of mad about having this "kink" thrown into my progress. Why couldn't this have happened last summer, when I was only riding my bike and doing the Wii Fit?!? Unfortunately, there's not a whole lot I can do to change the situation, so I need to work on my acceptance. Grr. I do appreciate all of your concern and caring comments - our little slice of blogland is full of wonderful people, and it means a lot to me to read such nice things. So thank you, and you, and especially YOU! Where we had a nice chat with George. 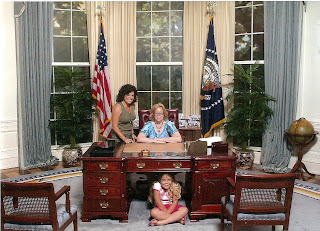 Theresa held a press conference... Then we crashed the Oval Office! Trying on our traditional "matching shirts" - these were cute, but at $29 too spendy! Um, a little too much cleavage came with these shirts! The six-pack of rainbow socks proved to be irresistible! Even Theresa thought this was too much icing! Theresa with Paco the Wonder Dog, making him *wait* for his cookie. I miss her already! And, as a point of reference, a picture from our last visit - two years ago. But I'm keeping it real, to show how much a person can change, if they work hard enough. 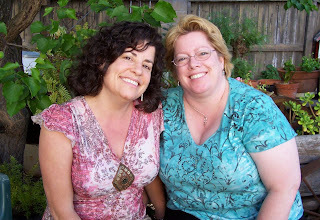 Barbara and me, April 2007. My mom had gallstones... they were painful. Just curious but can they blast those with a laser (like kidney stones)? Well, the sooner you get rid of the suckers, the sooner you'll be back to your bad self! Good luck with everything. Ack! Never fails, does it? But I'm so happy to hear it wasn't something more serious. I'm also curious if they will be able to do it with laser...that should make your recovery much easier, right? Your visit with your friend looks so fun...and ohmygosh I love those socks! had a friend w/gallstones and thats what they did---hope they can do the same for you as well. At least you are able to take care of it and move on, right? I know it's frustrating but you will be healed before you know it. You two look too darned cute! You look like you had so much fun. That's an awesome before picture! You've come a long way baby! Wow, if that last photo does not show you how far you've come and how well you are doing, nothing will! That is amazing, what a difference. Doesn't that just make you tingle with self-pride?? As for the surgery, don't worry, you will recover in no time and be back on your regular exercise routine, the surgery is very noninvasive. I was back on my feet the next day, ready to get back to work on day three. Your pics are amazing. WOW, such a big change! You look so radiant now. I need to go visit the library over there. I still haven't been. Looks like a neat place to see. So sorry to hear about the gallstones and your being sidelined but thankful it wasn't something worse. Hang in there - this too shall pass. Loved your photos! It looks like you had a terrific time with your best friend. And your 2007 photo was proof positive of what hard work and determination are all about. Congrats. I'm glad for you it was only gallstones and not something more serious. Your progress has been great! Isn't it great to have a best friend?It looks like you had so much fun.I love the matching shirts. Wowza you look different!! What a difference a year makes! Sorry to hear about your upcoming surgery but glad it's something common and not something scary! Keep us posted!! Sorry to hear about teh stones...but like you said things could be worse, count your blessing. Hopefuly you can get the laser thing done. You and the girlfriend are too cute, great before and after pics...you rock! Great job! I too like the rainbow socks. I have a pair that are teal green and everytime I wear them my husband rolls his eyes and asks me, "You're not going to wear those out are you?" I use them to keep my feet warm. You know, once I lost my weight I was cold a lot, so the socks comes out frequently! I have had many people I know have the gallstones and yes I heard they hurt. One doctor said it was because what they ate the other said it was she was losing weight I just think they have no idea what it is from. Love the before and after picture. Good luck with your surgery which hopefully will be soon. You'll feel so much better. Don't worry about what happens after. You'll be fine. One day at a time. You could still walk a week or so after for some exercise. Nothing too strenuous. Looks like you had a fabulous time with your friend. I hope they enjoyed the beautifully decorated rooms. Whew! I too am glad it isn't something more serious, and now that you are more fit you will recover even more quickly Shelley. You are so lucky to have such a lasting friendship. Love the pictures! So sorry to hear that you'll need surgery . . . but very glad that it's something so curable! Here's wishing you a smooth surgery and quick recovery. At least with respect to weightlifting, I think that some "rest periods" are recommended in any case . . . I bet your trainers at your gym will be able to help you work your plan around the necessary recovery time. Great photos . . . it looks like you had such a nice time with your friend, and WOW the change in you since her last visit is amazing! And there's no such thing as too much cleavage.